Travel above Dubrovnik by cable car, a breathtaking way to admire the city from above, before immersing yourself in its history, discovering its most fascinating monuments on foot. Our excursion begins with a coach transfer to the lower station of the recently restored cable car station. The ride takes just 4 minutes to reach the summit of Mount Srd, where we can enjoy a magnificent view of the city of Dubrovnik. The original Dubrovnik cable car, service which was inaugurated in 1969, was used by visitors and locals to enjoy the splendid view of Dubrovnik's old city and the surrounding area. The cable car system was destroyed during the war of independence that began in 1991, and remained out of service until its recent complete restoration. After a brief orientation tour at the top of the hill, we can take some photographs of this breathtaking panorama. A short walk takes us to the nearby Museum of the Croatian War of Independence, situated in a wing of the Imperial Fortress on Mount Srd, symbol of the defence of Dubrovnik from 1991-1995. Photos, prints, arms, war maps, military equipment and objects from the daily lives of the residents and defenders of Dubrovnik during the siege are on display in the museum in addition to original sound and video recordings and military battle flags. The return cable car journey takes us back to the lower station, just a ten-minute walk from Ploce Gate, the Eastern entrance to Dubrovnik's old town near to the old port, where our walking tour begins. 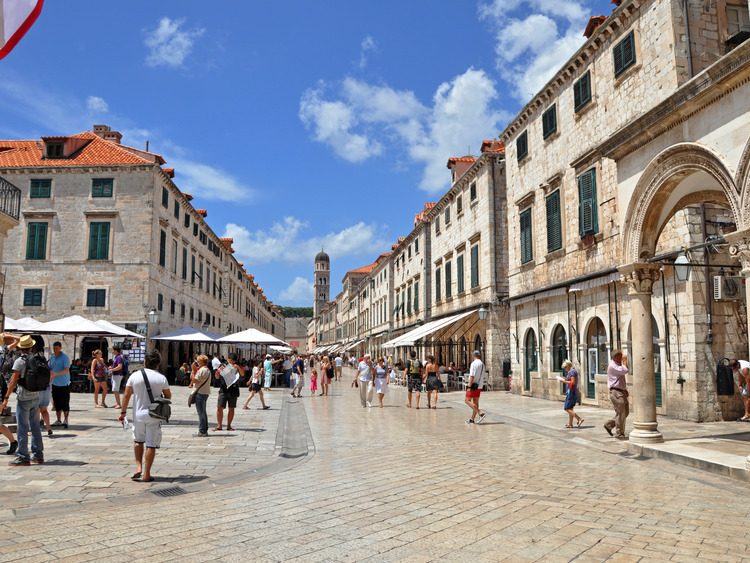 We stroll along the Stradun, Dubrovnik's main street, passing the Church of Saint Blaise, the Onofrio fountain, the Cathedral, Sponza Palace_,_the drawbridge and Pile Gate. Guests can return to the ship on the shuttle buses provided. The activity of the cable car is strictly connected to the weather conditions.